The Bakken-Three Forks rig count increased by three to 186 rigs running by the end of last week. The NDIC notes 182 rigs are active in North Dakota, but around 18 of those are in the process of moving in and rigging up. In recent news, North Dakota will begin enforcing new regulations to combat the illegal disposal of radioactive waste beginning on June 1st, 2014, . Leak proof containers will now be required at injection well-sites to store "oil socks", which are used to filter silt from waste water that is yielded from hydraulic fracking. The oil socks accumulate radium from the soil, rock and water present in the waste water. The U.S. rig count increased by 30 to 1,861 rigs running by the end of last week. A total of 323 rigs were targeting natural gas (7 more than the previous week) and 1,534 were targeting oil in the U.S. (24 more than the previous week). The remainder were drilling service wells (e.g. disposal wells, injection wells, etc.). 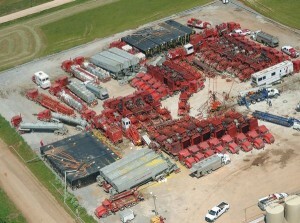 187 rigs are running in the Williston Basin across MT, ND, and SD. 179 are in ND alone. Note: The NDIC reports 182 rigs are active in North Dakota. That is 3 more than Baker Hughes reports in the Bakken area. The difference is likely accounted for in the number of rigs actually working, rigs that might not be serviced by Baker Hughes AND rigs in areas outside of the Bakken fairway. On any given week, a certain number of rigs are in route to the next well location or idle waiting to drill the next well. The NDIC notes that around 18 rigs are in the process of moving in and rigging up. The number of oil rigs increased by three last week to 186 rigs running by the end of the week . WTI oil prices decreased to $100.56/bbl on Friday afternoon. Williston Basin Sweet crude traded at $88.69/bbl on April 17th. The WTI-Brent opened up a bit, settling at ~$9 by the end of last week. The natural gas rig count in the region held flat at zero. Natural gas futures (Henry Hub) were trading$4.65/mmbtu by the end of last week. A little more than 10% of the production stream from the Bakken and Three Forks is attributable to natural gas and roughly half of that is NGLs. McKenzie County continues to lead development with 63 rigs running. Dunn, Mountrail, and Williams counties are the only other counties with more than 25 rigs running each. View the full list below under the Bakken Drilling by County section.